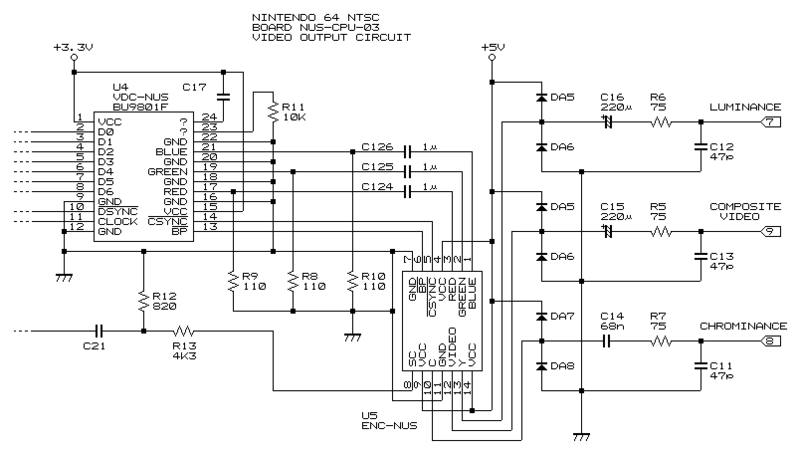 Early model NTSC machines have the RGB → video encoder on a seperate IC from the video DAC. With the aid of a small video amplifier, it's possible to drive an RGB TV/monitor. Make sure your board matches the diagram above. If U4 or U5 are missing/different then the board is not suitable. 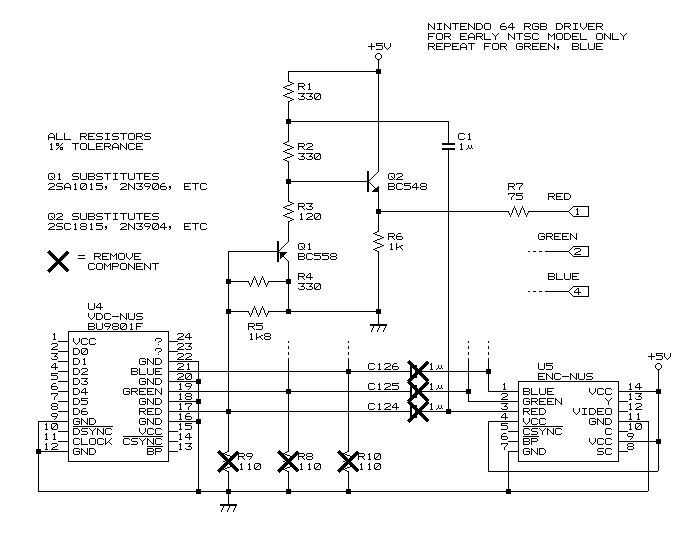 The amplitude of the RGB signal from the VDC-NUS can be changed by varying the load resistor to ground. The original value of this resistor is 110 ohms, this results in a signal of 0.7Vpp. I've removed a resistor and attached a pot then measured the video levels… When loaded with 75 in parallel with 110 (ie, connecting a TV directly to the output) then the video is at about 35% of what it should be. With the 110 resistor removed, it rises to about 60%, better, but not good enough… This amplifier will solve the problem. Operation: Simple two stage emitter follower configuration. R5, R4 set size of video signal. Q1, R3 are used to add extra DC offset for Q2. The signal taken from between R1 and R2 is fed to U5 via a coupling capacitor (0.7Vpp at this point). Video is also sent to a standard 75 ohm NPN driver (1.4Vpp at emitter, will drop to 0.7Vpp at the other end of the resistor when connected to a TV/Monitor).